Please Join Us as Seed to Table opens our gates for the second annual community dinner, celebrating our community, food and achievements for the year! 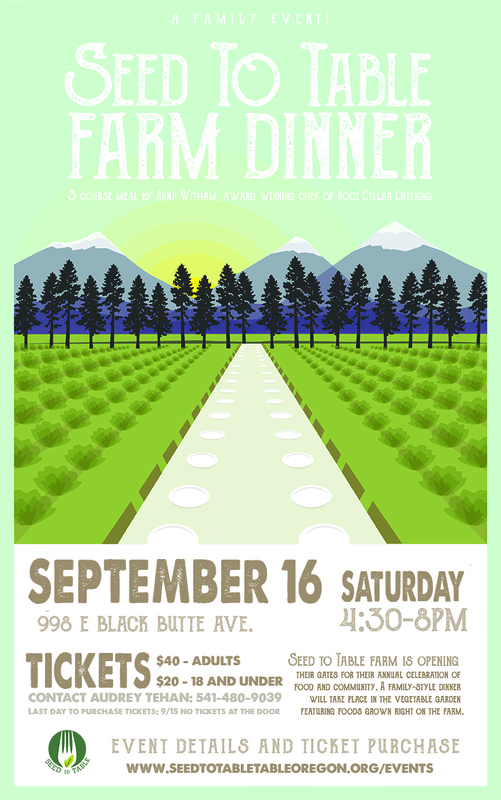 Our goal with the Fall Harvest Dinner is to host an affordable and unique dinner to connect food and community in Central Oregon. We are honored to have partnered with one of the best local food chefs in Central Oregon, Anna Witham of Root Cellar Catering. Root Cellar founder, Anna Witham's passion for food is evident in her ability to tell a story through a meal: gathering people in unexpected, ambient locations, and serving locally-sourced ingredients prepared balancing nourishment, beauty and pleasure, with a moment of discovery on every plate. **Please arrive by 5pm at the latest to enjoy the beauty of the farm, mingle and get to take a tour of the farm.